Click on image to see contents of each kit. Save time and money with our pre-made Basics of Breastfeeding Kits. We’ve done the work for you, combining our most popular visual products, including pamphlets, tip cards, bookmarks and our door hanger, into four great pre-assembled kits! Want to choose the titles to include in your kit? See our customize options for details. Please call for information about pricing and ordering kits. 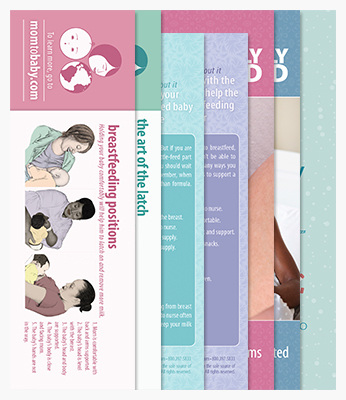 Learn more about the products that come inside our Basics of Breastfeeding Kits!